Julian Eisel (Severin) added a comment to T63263: Box selecting ".." in the file browser makes "Parent Directory" the default action.. Discussion about the general file browser design should go into T62971. A colleague and I are actually working on this so expect news soon. I'd vote for removing the '..' entry. For some users it might be confusing, and there is a button and a shortcut for it (P). With the button moved closer to the file path, I think that will become more discoverable. Julian Eisel (Severin) claimed T37982: File Browser options minor UI improvements. Julian Eisel (Severin) updated subscribers of rB40412499433e: Merge branch 'blender2.7'. Julian Eisel (Severin) added a comment to T57655: Crash after opening a v2.79 file saved with maximized area. Fixed the file browser glitch too now (rB0a28bb14222c). Julian Eisel (Severin) committed rB40412499433e: Merge branch 'blender2.7' (authored by Julian Eisel (Severin)). Julian Eisel (Severin) committed rB0a28bb14222c: Fix stashed full-screens returning to wrong layout (authored by Julian Eisel (Severin)). Committed fix for the crash now. Julian Eisel (Severin) committed rB7e5d1a9560a5: Fix T57655: Crash opening 2.79 file saved with maximized area (authored by Julian Eisel (Severin)). Julian Eisel (Severin) closed T57655: Crash after opening a v2.79 file saved with maximized area as Resolved by committing rB7e5d1a9560a5: Fix T57655: Crash opening 2.79 file saved with maximized area. Julian Eisel (Severin) updated subscribers of T60347: My custom workspace never shows up in the list of available workspaces. Just for the notes: What's there now is not the final design. 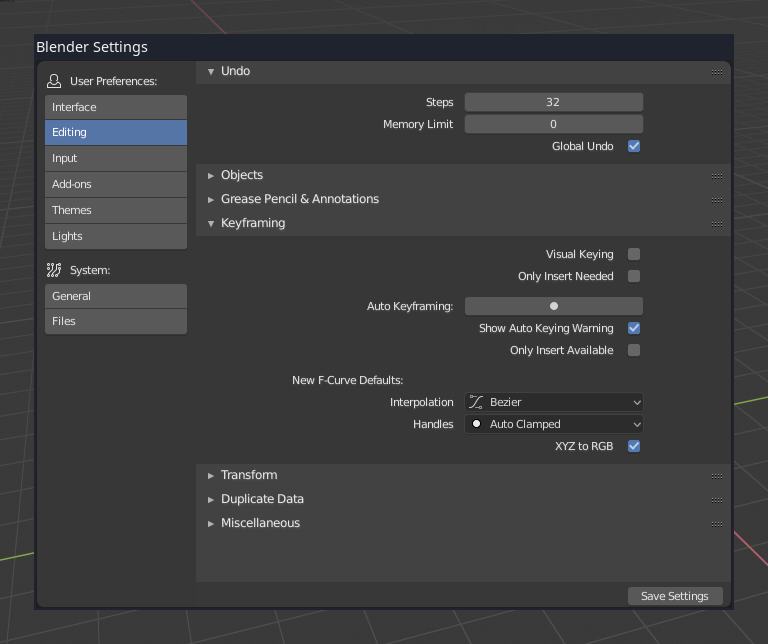 @William Reynish (billreynish) already started working on a design to edit this configuration from the new Preferences. I hope to get around to implement this soon. Tema Lavrov (shader) awarded T54115: Redesign User Preferences a Dat Boi token. Julian Eisel (Severin) triaged T60289: Active Tools Break Custom Gizmos as Normal priority. Julian Eisel (Severin) awarded rB5a43406e1bad: Cleanup: move DNA comments before struct members a Like token. Julian Eisel (Severin) updated the task description for T60289: Active Tools Break Custom Gizmos. Julian Eisel (Severin) updated subscribers of T60289: Active Tools Break Custom Gizmos. Julian Eisel (Severin) created T60289: Active Tools Break Custom Gizmos. Julian Eisel (Severin) committed rBaa6946f6c9a1: UI: Use grid-flow layout throughout Preferences (authored by William Reynish (billreynish)). Julian Eisel (Severin) committed rBe8d4304b5541: Correct version patching of Preferences theme (authored by Julian Eisel (Severin)). Mohamed El Hamd (elbox01) awarded rBa77b63c56943: UI: Preferences Redesign Part 2 a Love token. stefano severi (Tetone) awarded T54115: Redesign User Preferences a Love token. stefano severi (Tetone) awarded rBa77b63c56943: UI: Preferences Redesign Part 2 a Love token. Duarte Farrajota Ramos (duarteframos) awarded rBa77b63c56943: UI: Preferences Redesign Part 2 a Love token. Julian Eisel (Severin) closed T54115: Redesign User Preferences as Resolved. I've just committed rBa77b63c56943eb with which I'd consider the Preferences redesign as done. From this task I think the only thing missing is the search, which can be added as general improvement. 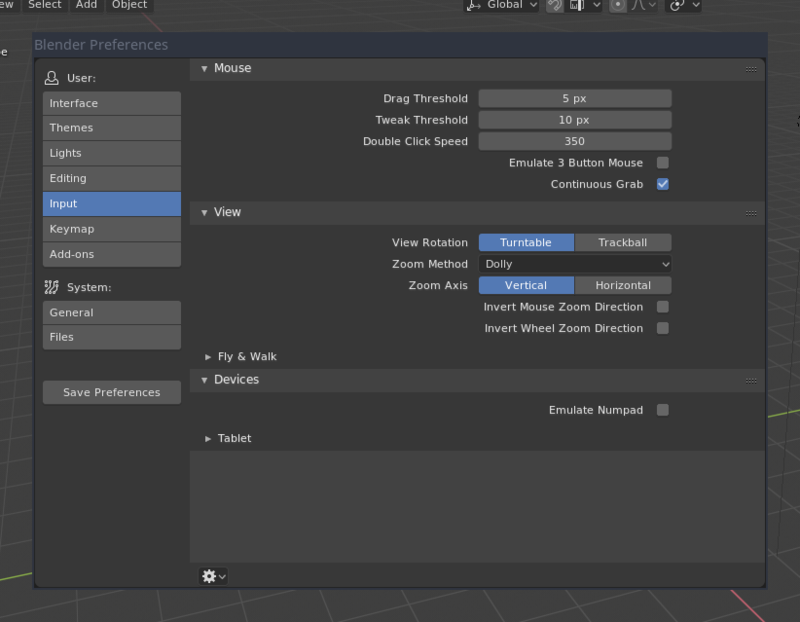 @William Reynish (billreynish) and I already planned to work on the workspace preferences UI next, but that will probably get its own task. Julian Eisel (Severin) committed rBDTd090d8dcb038: Update manual script after Preferences RNA changes (authored by Julian Eisel (Severin)). Julian Eisel (Severin) committed rBAC272b1a4ef077: Update contrib Add-ons to changed Preference API (authored by Julian Eisel (Severin)). Julian Eisel (Severin) added a comment to rBa77b63c56943: UI: Preferences Redesign Part 2. Aaand messed up commit hash pasting once again. Should refer to b00963afc14978b (rBb00963afc) as part 1. Julian Eisel (Severin) committed rBa77b63c56943: UI: Preferences Redesign Part 2 (authored by Julian Eisel (Severin)). Julian Eisel (Severin) closed D4148: UI: Preferences Redesign Part 2. Julian Eisel (Severin) committed rB000009f4d6f9: Use full region width for file path panels (authored by Julian Eisel (Severin)). Julian Eisel (Severin) committed rB3e159e7a9b52: Move text editor load/save options to filepath RNA (authored by William Reynish (billreynish)). Julian Eisel (Severin) committed rB42ff84eca673: Merge branch 'master' into userpref_redesign (authored by Julian Eisel (Severin)). Julian Eisel (Severin) committed rB8dc369da4a62: Cleanup: PEP 8 (authored by Julian Eisel (Severin)). Julian Eisel (Severin) committed rBAC28e9eb65b555: Update contrib Add-ons to changed Preference API (authored by Julian Eisel (Severin)). 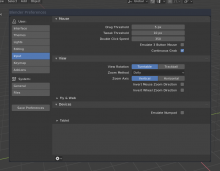 Julian Eisel (Severin) added a comment to D4148: UI: Preferences Redesign Part 2. 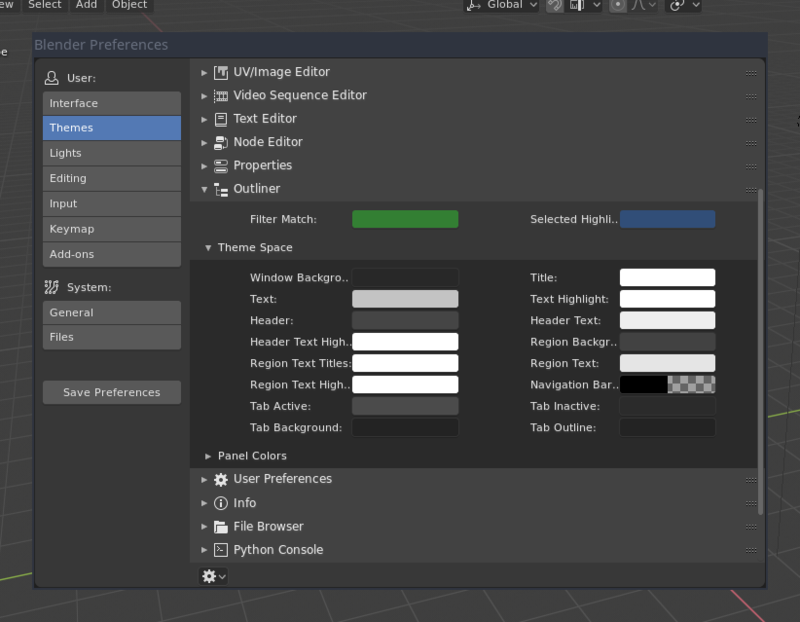 Pushed a new userpref_redesign branch to the contrib Add-ons repository with needed changes https://git.blender.org/gitweb/gitweb.cgi/blender-addons-contrib.git/shortlog/refs/heads/userpref_redesign. Other Add-ons don't seem to need updating. Julian Eisel (Severin) updated the diff for D4148: UI: Preferences Redesign Part 2. Julian Eisel (Severin) committed rBca9c55d0ee31: If anim player is not custom, gray out path option (authored by Julian Eisel (Severin)). Julian Eisel (Severin) committed rB62392f76c9aa: Revert changes to RNA path of undo settings (authored by William Reynish (billreynish)). Julian Eisel (Severin) committed rB52a7ecac35be: Merge branch 'master' into userpref_redesign (authored by Julian Eisel (Severin)). Julian Eisel (Severin) added a reviewer for D4147: Fix T59946: Multiple quit dialogs possible: Julian Eisel (Severin). Jacques Lucke (JacquesLucke) awarded D4148: UI: Preferences Redesign Part 2 a Like token. Julian Eisel (Severin) added a revision to T54115: Redesign User Preferences: D4148: UI: Preferences Redesign Part 2. Julian Eisel (Severin) added a task to D4148: UI: Preferences Redesign Part 2: T54115: Redesign User Preferences. Julian Eisel (Severin) added inline comments to D4148: UI: Preferences Redesign Part 2. Julian Eisel (Severin) updated the summary of D4148: UI: Preferences Redesign Part 2. Julian Eisel (Severin) created D4148: UI: Preferences Redesign Part 2. Julian Eisel (Severin) committed rB204ded594d2c: Avoid empty panel bl_label (authored by Julian Eisel (Severin)). Julian Eisel (Severin) committed rB5b868a8b262d: Tiny layout improvements (authored by William Reynish (billreynish)). Julian Eisel (Severin) committed rBd96596de294e: Fix: Cramped layout in object parent properties (authored by William Reynish (billreynish)). Julian Eisel (Severin) committed rBa421e57490e5: Merge branch 'master' into userpref_redesign (authored by Julian Eisel (Severin)). Julian Eisel (Severin) committed rB2822a7495859: Fix invisible scrollbars in Preferences (authored by Julian Eisel (Severin)). Julian Eisel (Severin) committed rB0093f5b1ecdc: Fix responsive Preference layout ignoring hiDPI (authored by Julian Eisel (Severin)). Julian Eisel (Severin) committed rB71b98a876994: Merge branch 'master' into userpref_redesign (authored by Julian Eisel (Severin)). Julian Eisel (Severin) committed rBf461ba611fae: Fix merge errors and whitespace cleanup (authored by Julian Eisel (Severin)). Julian Eisel (Severin) committed rB266b1e2cdbc1: Fix: Scrolling Preferences could cause blank UI (authored by Julian Eisel (Severin)). Julian Eisel (Severin) added a comment to D3982: Add back render buttons to render settings. Julian Eisel (Severin) committed rB5420be42d3ac: Fix "Show Preferences" shortcut not working (authored by Julian Eisel (Severin)). Julian Eisel (Severin) committed rB2e3fdeb54c9c: Avoid panel content margins in small regions (authored by Julian Eisel (Severin)). Julian Eisel (Severin) committed rB822aae0ff242: Merge branch 'master' into userpref_redesign (authored by Julian Eisel (Severin)). Julian Eisel (Severin) committed rBd75c410bf575: Another round of tweaks to new Preferences (authored by William Reynish (billreynish)). Julian Eisel (Severin) committed rBb789e5a82a0a: Own left-bottom aligned region for Save Preference button (authored by Julian Eisel (Severin)). Julian Eisel (Severin) committed rBea282f4de077: Merge branch 'master' into userpref_redesign (authored by Julian Eisel (Severin)). Julian Eisel (Severin) committed rB2db613225d0c: Merge branch 'master' into userpref_redesign (authored by Julian Eisel (Severin)). Julian Eisel (Severin) committed rBe5e885d0ecb9: Fix floating panel (HUD) applying DPI incorrectly (authored by Julian Eisel (Severin)). Julian Eisel (Severin) committed rB064cbe9f3fe0: Avoid creating & registering zero sized AZones (authored by Julian Eisel (Severin)). Julian Eisel (Severin) committed rB56a4e7cba0cb: More tweaks to Preferences (authored by William Reynish (billreynish)). Julian Eisel (Severin) committed rB6f6ad48c25fc: Merge branch 'master' into userpref_redesign (authored by Julian Eisel (Severin)). Julian Eisel (Severin) added a comment to T54115: Redesign User Preferences. Your changes seem reasonable. I'll push them in a minute. Julian Eisel (Severin) committed rBf7cbe35aecf5: Merge branch 'blender2.8' into userpref_redesign (authored by Julian Eisel (Severin)). Julian Eisel (Severin) committed rBb5d4bd8ac3ee: More small tweaks/fixes to new Preferences (authored by William Reynish (billreynish)). Julian Eisel (Severin) committed rB13b3869b5f38: Use term "Preferences" instead of "User Preferences" in the UI (authored by Julian Eisel (Severin)). Julian Eisel (Severin) committed rB0178cfa30550: Hide Preferences header when opened in temporary window (authored by Julian Eisel (Severin)). Julian Eisel (Severin) committed rB0b3603dcc1cd: Remove colons in Preferences section group names (authored by Julian Eisel (Severin)). Julian Eisel (Severin) committed rBdd6d1ac32c01: Shrink horizontal size of Preferences Window (authored by Julian Eisel (Severin)). Julian Eisel (Severin) committed rBe5b553a8b7e0: Various improvements to Preferences buttons/layouts (authored by William Reynish (billreynish)). Julian Eisel (Severin) committed rB3cfb9e0ec562: Merge branch 'blender2.8' into userpref_redesign (authored by Julian Eisel (Severin)). Julian Eisel (Severin) committed rB1571f18a8994: Merge branch 'blender2.8' into userpref_redesign (authored by Julian Eisel (Severin)). @William Reynish (billreynish) and I continued work in the userpref_redesign branch. Mostly working on the panel/subpanel based layout. William Reynish (billreynish) awarded rBb61dfee18a5c: Use subpanels for User Interface theme options a The World Burns token. Julian Eisel (Severin) committed rBb61dfee18a5c: Use subpanels for User Interface theme options (authored by Julian Eisel (Severin)). Julian Eisel (Severin) committed rB7cf1f30a99f3: Initial panel & subpanel based layout for theme section (authored by Julian Eisel (Severin)). 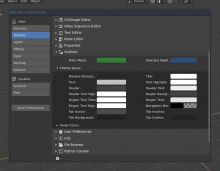 Julian Eisel (Severin) committed rB1b722f1ac80b: Merge branch 'blender2.8' into userpref_redesign (authored by Julian Eisel (Severin)). 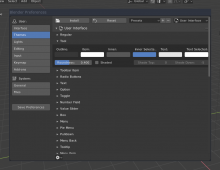 Julian Eisel (Severin) committed rBe86d851fef4c: Merge branch 'blender2.8' into userpref_redesign (authored by Julian Eisel (Severin)). Julian Eisel (Severin) committed rBc4bf66e54237: Use panel layout in most Preferences sections (authored by William Reynish (billreynish)). Julian Eisel (Severin) committed rB6d6aad08d724: Split keymap settings from "Input" into separate section (authored by Julian Eisel (Severin)). Julian Eisel (Severin) changed the status of T58891: Editor Type Button "User Preferences" is a black hole from Resolved to Invalid. The task status is for our internal management of reports. Resolved is only used for valid reports that were fixed by changes in code. Julian Eisel (Severin) closed T58891: Editor Type Button "User Preferences" is a black hole as Invalid. There actually are other ways out of it, like the Shift+Fxx shortcuts (e.g. Shift+F5 for 3D View). Julian Eisel (Severin) committed rB684f885e9552: Panel based, single column layout for the editing category (authored by Julian Eisel (Severin)). 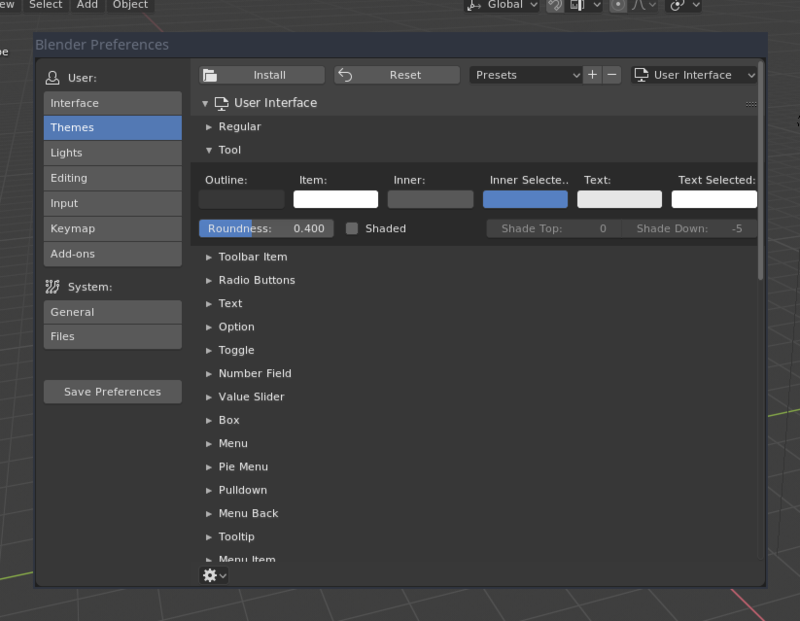 Julian Eisel (Severin) committed rB90f8900146d6: Merge branch 'blender2.8' into userpref_redesign (authored by Julian Eisel (Severin)). Zino Guerr (Zino) awarded T54115: Redesign User Preferences a 100 token. Hey, this is a nice improvement already. The only thing I would opine against is the name. 'Settings' is much more ambiguous than 'Preferences', especially in an app like Blender which includes many settings in the Properties Editor and lots of other places. The name 'Preferences' serves as a much more unambiguous differentiation from other settings, than the name 'Settings'. Plus, Preferences is a general standard name for this kind of thing. I agree with him, he makes a good point. So if nobody objects I'll change the term. Julian Eisel (Severin) added a comment to rBb00963afc149: UI: Initial User-Preferences redesign. Antonio Vazquez (antoniov) awarded T54115: Redesign User Preferences a Love token. Julian Eisel (Severin) created P834 UserPref Panel layout. Jonathan Lampel (jonathanl) awarded T54115: Redesign User Preferences a Love token. Julian Eisel (Severin) committed rB6c704b463275: UI: Disable font shadow in tooltip (authored by Julian Eisel (Severin)). Andrzej Ambroz (jendrzych) awarded T54115: Redesign User Preferences a Love token. xrg (xrg) awarded T54115: Redesign User Preferences a Like token. Ludvik Koutny (rawalanche) awarded T54115: Redesign User Preferences a Love token.